L.Ac, C.m.d. , Dipl. O.M. "Mr. Yao D. Hao gave me my life back" - Wendy O-K "I would recommend Mr Hao to anyone with chronic pain, sport or dance trauma, many neurological problems, etc." - Anna W. "He alleviated 70% of my pain on the first visit!" - Dan L. "Both my health and quality of life have improved immeasurably since I started seeing Yao Hao." - Debra T. "the best part is that the effect of the acupuncture has continued - I am still practically pain free." 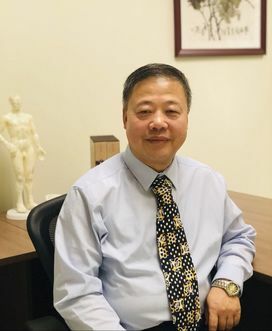 John S. "He has taken care of me and saved my life with his excellent skill and more than 25 years' experience" Pham K.
Acupuncturist Yao Hao was born to a family rich in traditional Chinese medical heritage. Hao was admitted to Beijing University of Chinese Medicine in 1982 and graduated in 1988, where he began systematic accumulation of traditional Chinese medicine knowledge working with eminent Chinese medicine authorities and prestigious professors and absorbing valuable experiences. He integrates his acupuncture and Traditional Chinese Medicine treatments with 30 years of experience to bring health and balance to your life. Appointed in 2015 by the Beijing University of Chinese Medicine as one of 46 clinical experts and only 1 of 2 in America. Hao Health and Healthing LLC has been treating patients in the Northern Virginia and Greater D.C. Metropolitan area for over 15 years, with astounding improvements in patient health and well being. Acupuncture has helped billions of people over the past 5,000 years. It helps to relieve symptoms and signs of many health problems. It can also uncover the underlying root causes of those symptoms. This ancient health care system is proving itself as an effective alternative and adjunct treatment modality. It is a safe, effective, and natural approach to help regain and maintain health and well being.